One of the biggest questions among Latin America watchers these days is whether - as critics say - President Michelle Bachelet is taking Chile radically to the left, endangering its longtime reputation as the region's star economy. It's a question that many Chileans are asking themselves here. The business community, which has had a good relationship with left-of-center governments for the past two decades, and co-existed peacefully with Bachelet during her 2006-2010 first term, is up in arms against Bachelet's massive fiscal reform. Bachelet, who took office two months ago after winning elections by a landslide with a new coalition that includes the Communist Party, wants to increase corporate taxes from 20 percent to 25 percent - and by some measures to 35 percent. Opposition parties, business people and a growing number of academics say the president is killing the goose that lays the golden egg. In her rush to collect $8.2 billion to pay for free higher education - one of her key campaign promises - she threatens to polarize the country like never before since the end of the military dictatorship in 1990, and bring domestic and foreign investments to a halt, critics say. Critics say the government's fiscal reform will not only affect the super-rich, but an estimated 900,000 Chilean companies. "Bachelet is playing with fire," says Patricio Navia, a professor at New York University. "In Chile, reforms have always been gradual, which has helped the country grow and reduce poverty. Now, she is coming across as wanting to implement radical changes, which could threaten stability and growth." A Chilean Central Bank monthly survey of economic expectations released this week shows that most experts believe the country will grow by 3.2 percent this year, down from their expectation of 3.4 percent last month, and of 4.8 percent 12 months ago. The International Monetary Fund recently revised down Chile's growth projection for this year, from 3.6 percent to 3.3 percent. A new report on Chile by the Eurasia Group, a major U.S. political risk consultancy, starts like this: "Short-term trajectory: Negative," "Long-term trajectory: Negative." For more than two decades, Chile has been Latin America's undisputed success story. Since 1990, Chile's poverty fell from 40 percent of the population to 13 percent, and the country's per capita income has quadrupled to nearly $20,000 a year. Most international rankings of education, technology and economic development place Chile as the No. 1 country in Latin America. "This is a country that will maintain its political stability, that will maintain its economic stability, that will continue to respect the rules of the game, but that at the same time needs significant changes so that its stability can be maintained in time. That's why we need the tax reform, to pay for the education reform, and to finance other social reforms to reduce inequality." He added, "Chile is one of the 15 countries in the world with the biggest income inequality rates." The massive student protests of last year were mostly supported by the demonstrators' parents, who pay one of the most expensive higher education bills in the world, he explained. Munoz argued that the tax reform seeks to preserve - rather than kill - Chile's successful economic model. If nothing is done, social frustration could turn into "something more serious" and threaten Chile's stability, he said. My opinion: The Bachelet government was elected with a mandate to reduce inequality. And, judging from what has happened in Venezuela and other countries, it is right in believing that preventive changes are better than "revolutionary" changes that most often end in economic disasters. But Bachelet may be forgetting that the world has changed since she left office in 2010. Emerging markets are no longer the darlings of foreign investors, and Chile is no longer the only game in town in Latin America. Colombian President Juan Manuel Santos told me in an interview last week that his country is "Latin America's most solid economy." Peruvian officials are already selling their country as "the new Chile." Spain and other European countries are recovering, and beginning to draw investments. If Bachelet doesn't pay more attention to her country's image while she addresses much-needed social reforms, Chile will find itself losing the investments it needs to continue growing and solving its pending assignments. 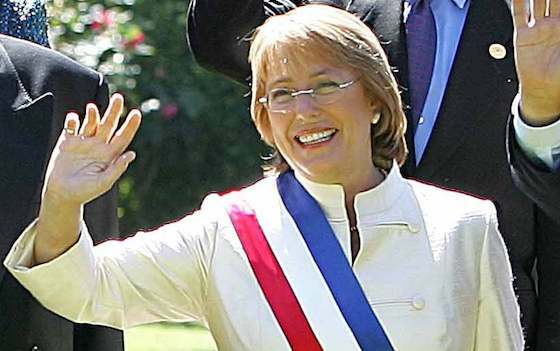 Bachelet can still achieve both goals, but only if she maintains the tradition of dialogue and gradual change. "Chile's Success Story May Be at Risk"